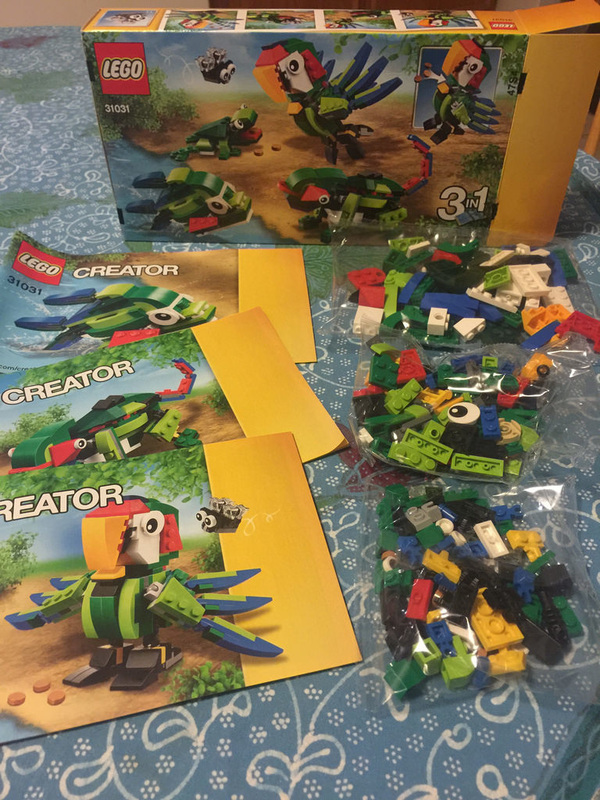 Once the box is opened, three instruction boolets fall out (one for each animal – the piranha-esque fish, the chameleon, and the parrot, frog and fly), and three bags of parts. ​The parts in this set are very bright, vivid colours that look great. When I opened the bags, the colours just spilled out! The set introduced two parts in new colours – the round 1×1 tile in medium nougat, and the 1×3 brick with bow and no studs in dark green. You get three and four each respectively, so it’s not bad. The 1×1 tile is still only available in this set, while the other is in another three. 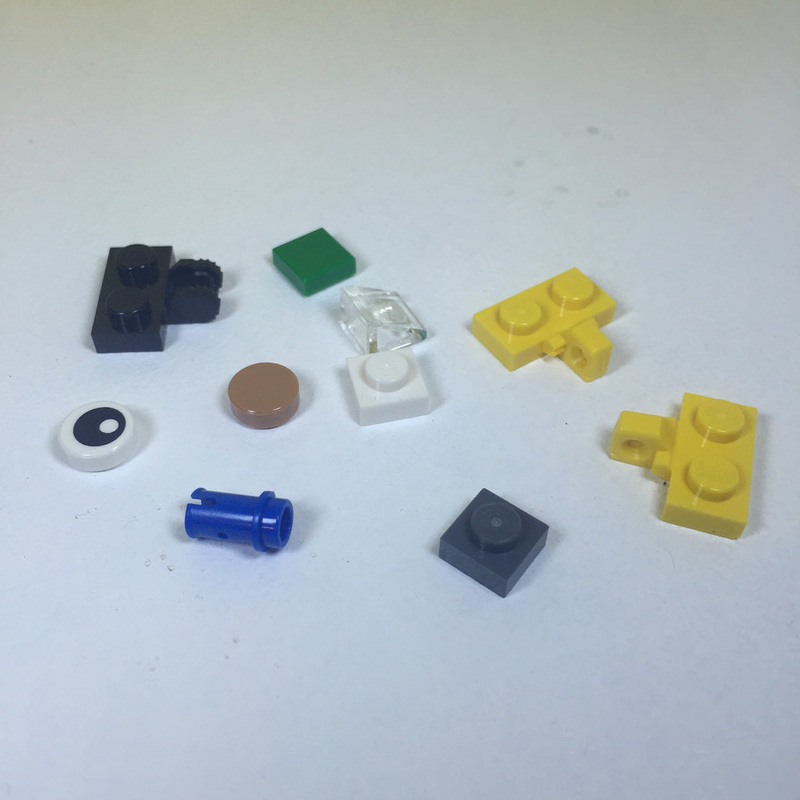 Many of the other parts appear in very few sets, so it’s a good set to grab, and if you can, to get an extra one. There are hinges, slope plates, bow plates, and plenty more. Because there are alternate builds to this model, there’s no real spares, as they could be used with the other models, but what I got was pretty good. Some more hinges in particular were pretty handy. 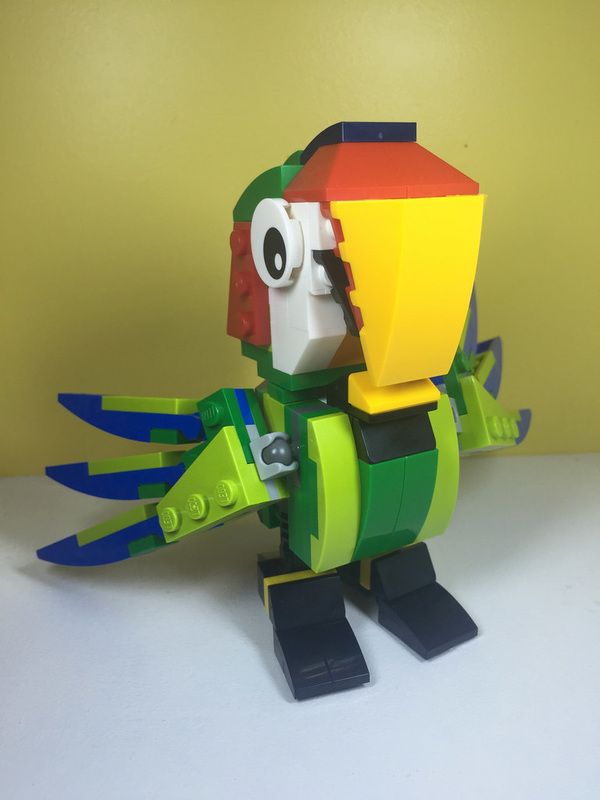 ​While I only built the parrot, the build was really good. You first start off with the fly, which is very cute! It’s an extremely simple build, and the use of the dark grey hinge piece works well as the “mouth”. 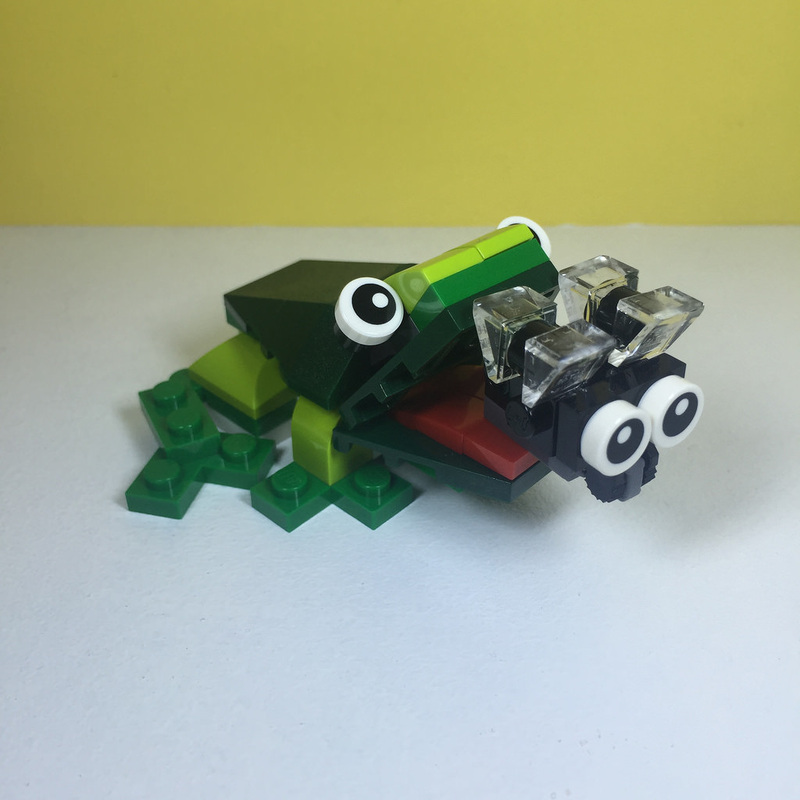 Next up is the frog. I really like this little model! 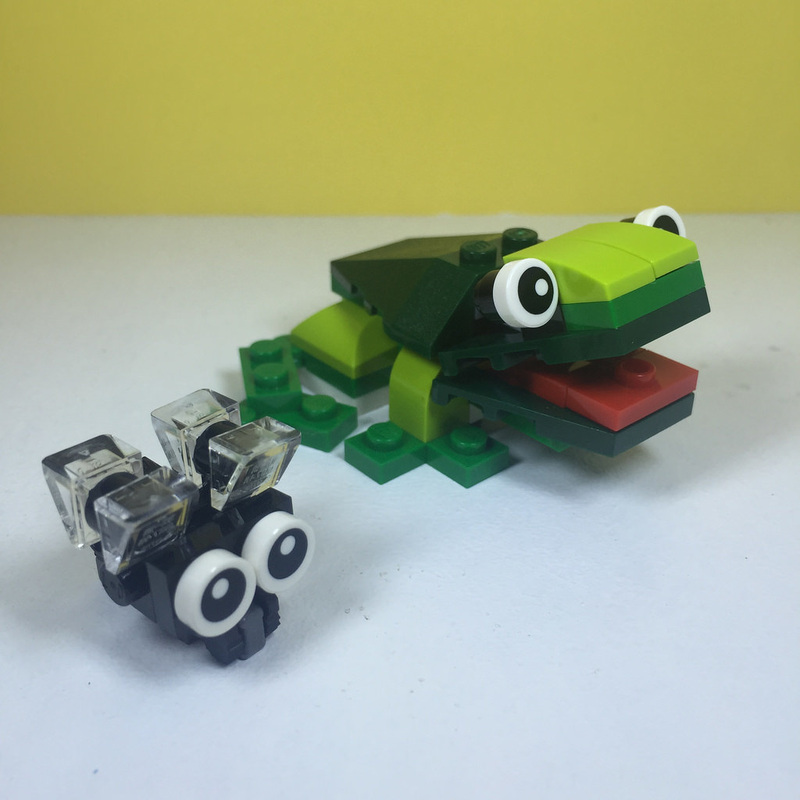 I’ve never had any brick built animals before, and the frog is really great. The feet are very well represented, and the face is quite poseable. It can even open it’s mouth wide enough to eat the fly. I’m very impressed. Finally, there’s the parrot. After doing some looking around on the internet, it’s apparently a Great Green Macaw, and it works quite well. It looks pretty close to the actual bird. There’s some good techniques in the build, and I love the fact that the eyes swivel. The wings are simple enough, but still quite beautiful in their simplicity. Ok, let’s take a look at how it rates. There are a fair few elements in here that are not in many other sets. While there aren’t too many that this set introduces, the colours in the set as a whole are really great. The pooping mechanism is hilarious and very clever, but it’s really only funny a few times. 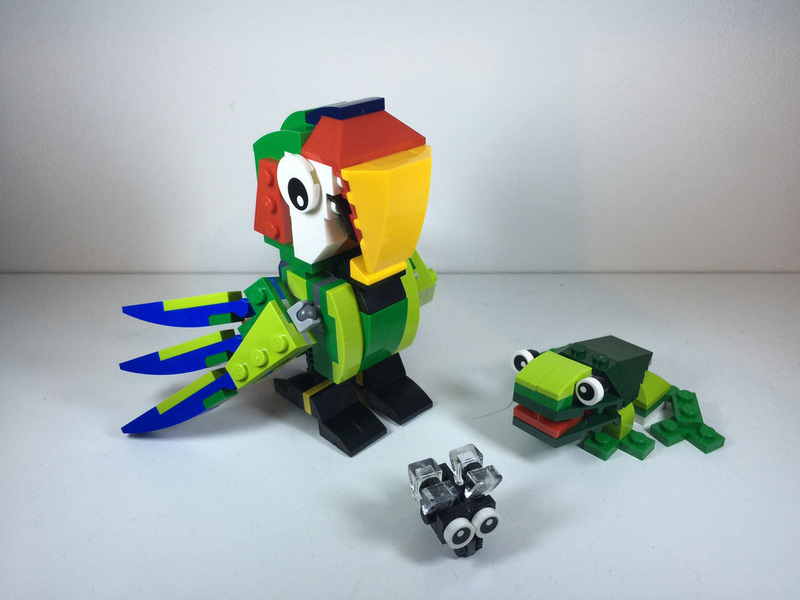 The wings are able to be positioned in a number of different ways, as well as the feet, and the frog has some mobility also, but I’ve got the feeling the parrot is a bit of a one trick pony. It’s good though, that the other models are available, as well as a whole stack of other community created ones. I reckon kids will love it, so it gets a high score. This is for the parrot at least. There are plenty of good SNOT techniques here, and the hinges add a little extra. Plus the extra models, it gets a nice score. The value for money here is pretty good. It’s cheap per element, currently at around .10c new, and this is increasing in it’s used value. It’s increased in value over the last month, and will be interesting to see where this goes in a few month’s time. 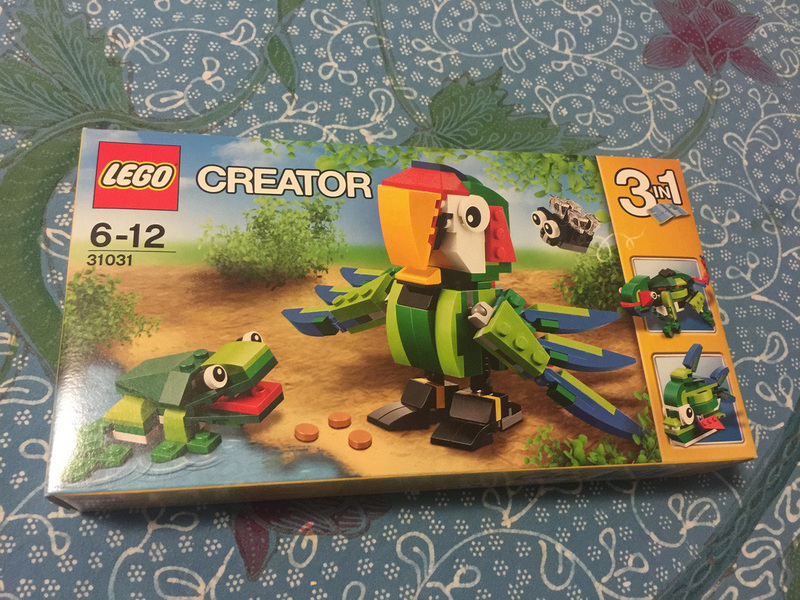 As far as being part of a collection, it’s the only pooping bird that LEGO has done, and it’s part of the highly sought after brick built animals collection, so it’s definitely worth getting. Next week, we’re heading back to the Pirates, with 70410: Soldiers Outpost. Don’t forget to like BricktasticBlog on Facebook and Instagram! This cute set is officially retired in Europe as of November 2016.